Caecilian Worms Activity Sheet is a totally FREE Downloadable Science Worksheet for Kids. This free printable science activity sheet about Caecilian worms is suitable for Elementary school kids in 1st – 5th Grades. Grammar & Elementary school kids can enjoy this free science worksheet as a reading comprehension activity. Kindergarten kids and Pre-K kids can use this as a listening comprehension tool. 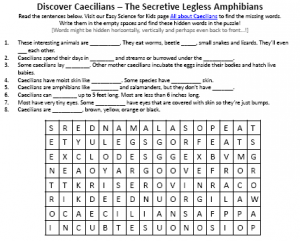 The Caecilian worms activity sheet has a section with a fun word searching puzzle game and a hidden-and-missing-word puzzle. This fun words searching puzzle game on Caecilian Worms is ideal for your kids to learn and discover fun facts all about Caecilians. This can be a great help for private educator or parents to teach science to kids in a fun way. What are Caecilian worms? Caecilians are carnivores legless amphibians that are seldom heard of. Most of them have very tiny eyes that are sometimes covered with skin. They are a cold blooded animals that look like a large worm or slick snake and live mostly in tropical areas. Our website is a great free online resource for educators with many more FREE downloadable science worksheets for kids. [sociallocker]Download this FREE science worksheet for kids about Caecilians. Download this FREE Caecilian Worms Activity Sheet for Kids! Liked this Free Caecilian Worms Activity Sheet? For lengthy information on Caecilians, click here. Declan, Tobin. " Caecilian Worms Activity Sheet- Free Downloadable Science Worksheets for Kids - ." Easy Science for Kids, Apr 2019. Web. 21 Apr 2019. < https://easyscienceforkids.com/caecilian-worms-activity-sheet-free-downloadable-science-worksheets-for-kids/ >.